Cassandre was born Adolphe Jean-Marie Mouron in 1901 in the Ukrainian city of Kharkov. Cassandre's father, though raised in Bordeaux, moved to Russia to escape his family's pressure to follow a prescribed career path. In spite of this, Adolphe and his siblings were sent to France for schooling and the family left Russia during the onset of WWI. 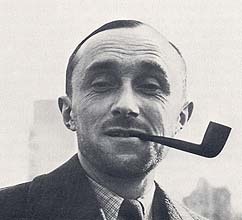 Cassandre was a well, if unconventionally, educated artist, attending the Ecole des Beaux-Arts (from which he walked out after one hour) and the Academie Julien. Cassandre took a job with the printer Hachard et Compagnie where he began as a routine employee, and by 1922 he created his first poster which he signed with the pseudonym, "A. M. Cassandre". In 1924, Cassandre married Madeleine Richard, the daughter of the largest automobile manufacturer in France at the time. In 1925, Cassandre's son, Henri Mouron was borne, and in 1939, the marriage ended in divorce. From 1923-1928, Cassandre produced several wonderful posters for Hachard including the famous "Nord Express". By 1927 he was receiving prestigious commissions from all angles, the most impressive being the French National Railways. Together with another poster designer, Charles Loupot, Cassandre formed Alliance Graphique in 1930. The design company prospered and many of the best French posters came from this team, which later included French artist, Jean Carlu. The business shut down when its printer was tragically killed in a car accident in 1934. Another venture of Cassandre's was his school, which was not lucrative, but schooled two famed French poster artists, Raymond Savignac and Bernard Villemot. Another failed endeavor pushed Cassandre to try something new: scenery and costume design. This part of his career far outlasted his poster and graphic design periods, as he continued to design for performances into the 1950's. Although he was considered one of France's most treasured artists, the last ten years of Cassandre's life were filled with poverty and depression. Perhaps, depressed for the lack of commissions and support, Cassandre committed suicide in 1968.